Though internet relay chat (IRC) is old technology, many people still use it daily. One of the most popular IRC clients for Windows is mIRC. This client is impressively feature-complete. However, it does not offer a way to satisfyingly solve one of the grievances of many IRC users: the flood of join and part messages in big channels, caused by the constant stream of people coming in and leaving. mIRC only offers the option to either show or hide all join and part messages completely; but does not allow for any fine-tuning. What I was looking for was a way to show or hide join and part messages based on the size of the channel. If a channel has only few people, I’d like to see all joins and parts. If, however, a channel has many users (e.g., more than 25), this quickly becomes a nuisance. In addition, even in big channels, I’d like to see all joins and parts of people who were recently active in the channel, so as not to accidentally reply to someone who has left in the meantime. With this specific need, I created a solution, which I have made available on github. It can be added to mIRC by loading it as a script (Tools -> Scripts Editor -> File -> Load). 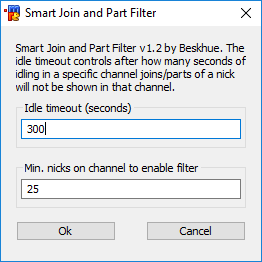 Configure it by right clicking in a chat window, and select Join/Part Filter -> Settings. Programming this solution using mIRC’s scripting language was definitely a fun project: the scripting language is quite basic with little documentation, and as mIRC’s interpreter offers hardly any assistance when things go wrong, it quickly turns into a puzzle. However, it’s also quite powerful and allows you to access and modify many things within mIRC. Discord is a great platform for text and voice chatting. However, one feature has been seriously lacking for a while now: the ability to see a log of people joining and leaving voice chat rooms. Luckily, Discord provides a way to create bots. These bots have access to a variety of events occurring on a Discord server, including voice chat events. Of specific interest to us, bots can track events of people joining and leaving voice chat rooms. If you’d like to use this bot, feel free to use the code provided; you’ll probably need to create a new developer application on Discord and turn it into a bot user, and read the read-me. In a previous post we looked at the fuel requirements for rockets to reach escape velocity. We calculated the fuel requirements using the rocket equation. This equation takes into account the conservation of momentum. However, momentum is not the only property influencing the velocity of the rocket during a launch. Rockets expel their fuel over time. During this time, the rocket is pulled back due to gravity. Only if a rocket could instantaneously expel all of its fuel, and when ignoring atmospheric drag, the escape velocity would be reached instantaneously and the equation would hold. Taking the burn-time and gravity into account yields a difficult differential equation. We can implement that equation in a computer program to simulate the launch.